A beachfront, high-rise apartment building at beautiful Burleigh Heads. All apartments have stunning ocean and beach views. Take in the cool sea breeze from your own private balcony. Our building features fully self-contained one and two bedroom apartments at very affordable rates. All rooms have full kitchen and laundry facilities. Free Cable TV is available to all apartments and DVD players are available for your enjoyment. The two high-rise towers of Gemini Court offer unforgettable holiday accommodation, with stunning ocean views from all apartments. 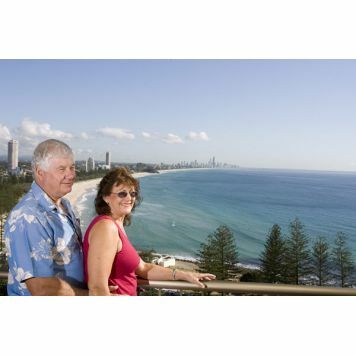 Our one and two bedroom fully self-contained apartments have the most unique view in Burleigh as the ocean vista stretches north along the Gold Coast to Surfers Paradise. This view offers you ocean & beach views - a superb feature that is unique to this property. 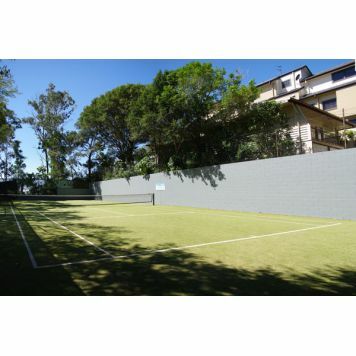 Building facilities include a newly renovated outdoor heated pool, heated spa, full size tennis court, BBQ area with two free BBQ's, and secure underground car parking. Our tour desk is open 8.30am to 5pm and gives visitors the opportunity to speak with our knowledgeable staff. We can help find the perfect tour for you - just ask us! Internet facilities are available in the reception area and every apartment is now wired for wireless or ethernet connection. 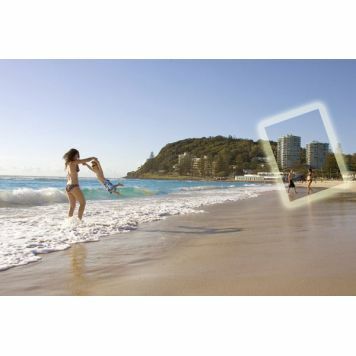 We are situated just metres from the patrolled beach and Burleigh shopping centres, making us a well known land mark in the Burleigh Heads area. Introducing the Superior Apartment. GUARANTEED ABOVE 10TH FLOOR with superior furnishings. Enjoy this spacious 2 bedroom / 2 bathroom fully self contained apartment that has magnificent ocean and beach views. The apartment features a full kitchen, laundry, large living area and private balcony. Enjoy a glass of wine while soaking in that spectacular view. Or simply relaxing on your private balcony with a glass of wine - soaking in the stunning ocean views. SIMPLY GORGEOUS. Spectacular two bedroom superior apartment. STUNNING OCEAN VIEWS. Delightfully appointed and very spacious. Queen in the main bedroom with large walk in robe and ensuite bathroom. Two singles in the second bedroom and a second bathroom. Air-conditioned throughout, stereo, DVD, Plasma TV, digital foxtel, broadband internet, security parking, and tastefully furnished. Free Security Parking. You will be delighted. Come and enjoy the best that Gemini Court has to offer! OFFICIALLY RATED 4 and a HALF STAR! Fully self contained and very spacious 2 bedroom superior apartment on the ground floor with a large private courtyard and overlooking Burleigh Beach. Queen bed in the main bedroom and a queen and a single bed in the second bedroom. One bathroom, air conditioning, DVD player, stereo, spacious living area, Foxtel, broadband internet available, direct dial phones, full kitchen with full sized fridge, oven, hotplates, microwave, coffee machine, kettle, and electric frying pan. 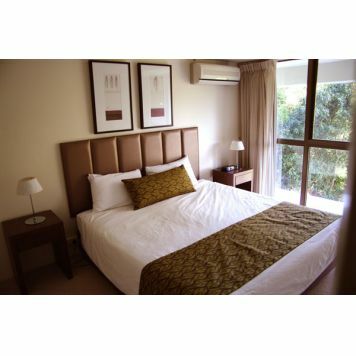 The unit is situated on the quietest corner of the property to ensure your stay is restful and pleasant. When only the best will do, this is it. This apartment is of the highest standard on the coast. With magnificent views of the coastline from every room in this high floor 2 bedroom 2 bathroom apartment. Fully self contained, private balconies, Plasma television, DVD, stereo, air conditioned throughout, superior furnishings, modern kitchen with top of the range appliances, simply spectacular. 1 Bedroom Ocean View Apartment - 3 nights ENJOY A ROMANTIC WEEKEND! One bedroom fully self-contained apartment with a 3 night minimum. 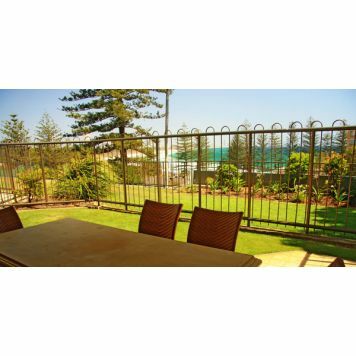 Private balcony with superb ocean view, digital foxtel, broadband internet available, secure parking. 1 Bedroom Ocean View Apartment - 5 Nights. One bedroom fully self-contained apartment with a 5 night minimum. 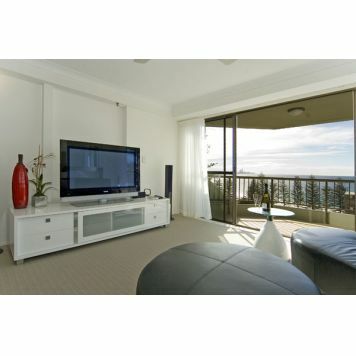 Private balcony with superb ocean view, digital foxtel, broadband internet available, secure parking. Save 45%!!! 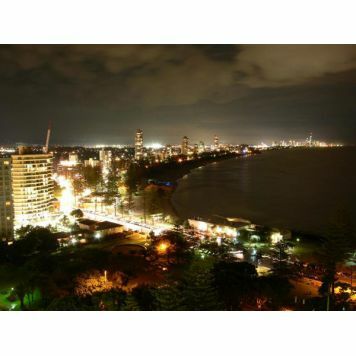 1 Bedroom Ocean View Apartment - 7 nights Located on the point at Burleigh Heads adjacent to the national park with stunning views from Burleigh Beach 40 kilometers up the coast. Fully self contained 4 star accommodation. 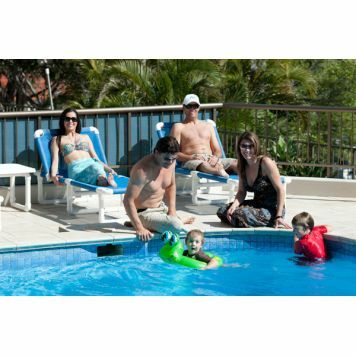 2 Bedroom Hinterland Superior - 3 nights. Stunning hinterland and national park views in a magnificent and very spacious 2 bedroom fully self-contained apartment. The apartment is officially rated four and a half stars by AAA/RACQ. For the discerning holiday maker or business traveler. 2 Bedroom Ocean View Apartment - 3 Nights. Fully self contained and very spacious 2 bedroom apartment with a 3 night minimum. 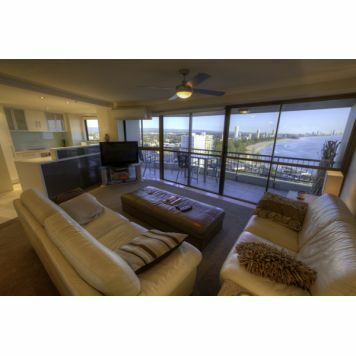 Stunning ocean views from your private balcony, large living area, Foxtel, direct dial telephones, broadband internet, secure parking, ensuite, 2nd bathroom. 2 Bedroom Ocean View Apartment - 5 Nights. Fully self contained and very spacious 2 bedroom apartment with a 5 night minimum. Stunning ocean views from your private balcony, large living area, Foxtel, direct dial telephones, broadband internet, secure parking, ensuite, 2nd bathroom. 2 Bedroom Ocean View Apartment - 7 Nights. Fully self contained and very spacious 2 bedroom apartment with a 3 night minimum. Stunning ocean views from your private balcony, large living area, Foxtel, direct dial telephones, broadband internet, secure parking, ensuite, 2nd bathroom. OFFICIALLY RATED 4 AND A HALF STAR. For the discerning business traveller or holiday maker. Magnificent views, private balconies, large beautifully decorated apartments with flat screen tv's, leather couches, superior furnishings. Simply the cream of the crop - the highest quality apartment you will find in fully self contained accommodation. Free use of Car Park, Free Cable TV. Wireless internet available. OFFICIALLY RATED 4 AND A HALF STAR. For the discerning business traveller or holiday maker. Magnificent views, private balconies, large beautifully decorated apartments. The highest quality you will find in fully self contained accommodation. VERY POPULAR WITH FAMILIES WITH YOUNG CHILDREN. Fully self contained 2 bedroom superior apartment on the ground floor with a large private courtyard, air conditioning, DVD player, stereo, spacious living area. Foxtel, broadband internet available. On site - telephones and computer connections available in every apartment including broadband cable internet! Fax and copy facility at office. Internet terminal in the foyer. If you arrive outside of business hours The office will be closed, your keys will be in the safe located at the North Tower entrance. Pull into the first driveway / visitor's carpark and enter the building. You will see a small safe on the right hand side of the entrance foyer. Inside the safe, you will find an envelope with your name on it. Inside will be a set of keys and a welcome letter. On the reverse is a map to show you where to park your car. If you have any problems, you can dial '9#' on the call panel beside the safe and reach the night manager. Please come down the following day to officially sign the guest register. We look forward to welcoming you to Gemini Court Holiday Apartments! These extra's are to be paid direct to the hotel on arrival. From Brisbane Take the M1 to the Burleigh Heads exit. Follow Reedy Creek Road (becomes West Burleigh Road). Turn right (south) on the Gold Coast highway. Turn left on Goodwin TCE. Turn right on Hayle St.
From Gold Coast Airport Take the Gold Coast Highway to Burleigh Heads (do not follow the M1). Turn right on Goodwin TCE. 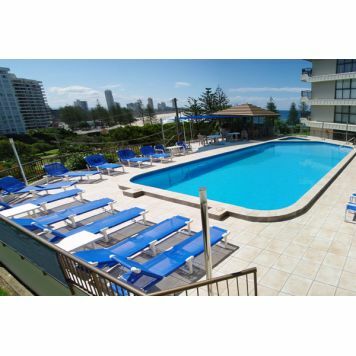 Turn right on Hayle St.
Gemini Court Holiday Apartments is situated in the heart of beautiful Burleigh Heads on the fabulous Gold Coast. Nestled next to Burleigh Heads National Park and just metres from one of Australia's safest and best-patrolled beaches, Gemini Court is the perfect holiday destination. 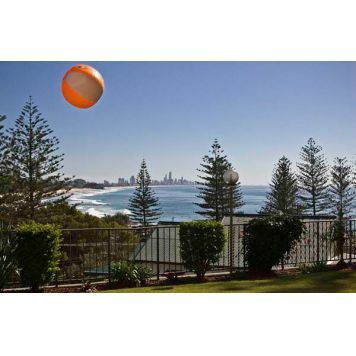 Burleigh Heads is directly between Coolangatta and Surfers Paradise, offering world renowned surfing beaches and a wonderful National Park where you can see some fabulous scenery and a range of wildlife, the Gold Coast has something for everyone. Burleigh Heads is a superb spot to catch spectacular views of the Gold Coast skyline - see up to 30 kms of beaches from your hotel room! 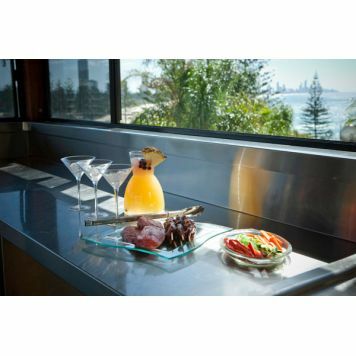 The beaches in Burleigh are lined with beautiful parkland, with picnic and BBQ areas for you to enjoy. Fabulous beaches and fabulous food makes the perfect blend on a sunny day. Alternatively sample the local cuisine in one of the beachfront cafes or restaurants and then wander around the great art and craft markets which are very popular.